Apparently, the New Hartford people made another parlor guitar with the leftover bodies of the 1997 Collectors. The Ovation 5741 has a wide neck with a solid headstock (slothead on the 1997 Collectors) and 14 frets clear of the body (12 on the 1997 Collectors), a standard OP-24 preamp instead of the TS (with the battery slot accessible from the side) and is finished in a nice dark sunburst. I saw one of these nice guitars at the 2014 edition of my Music Show Milano. It was very clean, sounded and played fine, the price was OK, but the case was missing, so I let it go. But when I saw a “NOS” 5741 advertised on an Italian musical instruments classifieds website, I could not resist. 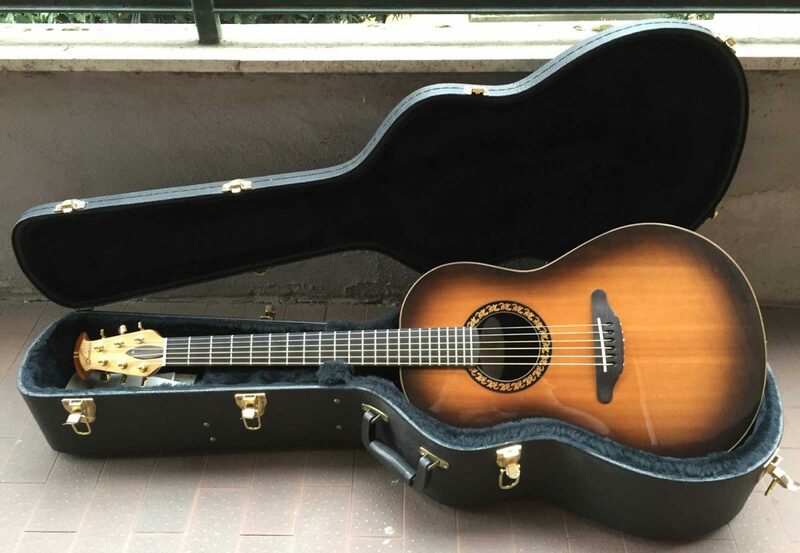 The guitar was in Sicily and was a leftover from the previous distributor, with its original case and all the case candies, but was offered at a non realistic price. Fortunately after a few emails and telephone calls I convinced the dealer to accept my offer and I got it. After some normal setup (I removed the bridge inserts to lower the action, filed slightly the saddle and the nut, tightened the trussrod) and with a new set of strings (it still had the original 1997 strings!) this small guitar came to a new life. A slim, well sounding and playing, lovely guitar that fits perfectly in the roundback herd. Thanks Gianni!